What car would you drive in a race across the country? After viewing The Cannonball Run for the 100th time this past week we started wondering the obvious question when faced with the prospect of a high speed coast to coast automotive competition. What car would you drive in a cross country race? With that in mind we want to know what vehicle you would use for an unorganized and potentially illegal cross country competition. In a sea of weird, ridiculous and exotic choices, I am making a prudent automotive decision for this QOTW. 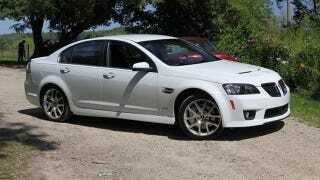 I would take a Pontiac G8 GXP across country. I've already learned many times in my quarter century on this planet that you can go a lot faster in a car that doesn't draw attention than a car that does. The GXP means a 415 horsepower LS3 V8 under the hood which combined with the far superior six speed manual transmission would have plenty of power to get me across country while remaining fairly low profile. If you haven't watched The Cannonball Run, you should (it is ridiculous and cheesy great), but first tell us, what car you would drive in a race across the country?